Back in March, I took five days of vacation and toured Virginia's historic triangle. On my first day, I spent a rainy day walking around the Yorktown battlefield. 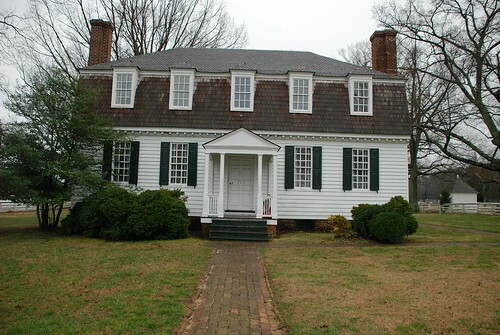 Below, is the Moore House. This is where the British surrender was negotiated. Imagine, riding up the drive via carriage or on horse back. 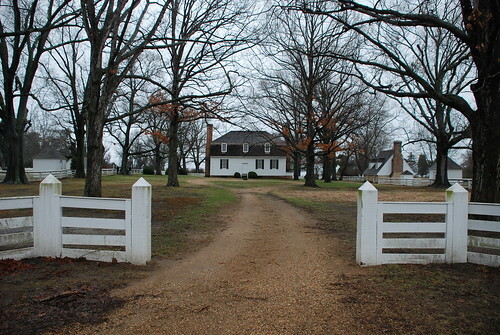 The front door of the the Moore house. 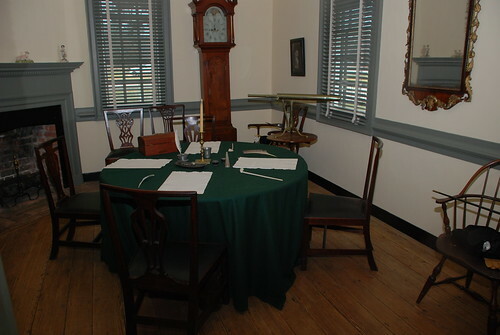 Inside the sitting room, a recreation of how it may have looked at the time of the surrender. At the table were representatives of the British (2), French, and the Americans. The interesting fact shared by the park ranger was that the only one at the table that understood both English AND French was the American Lt.Col. For more information on the Moore House and the articles of capitulation that were signed, check out the National Park Service's Moore House site.